Beans, unlike most vegetables, contain a lot of protein and are sometimes used as a vegetarian protein source. They are also a significant source of carbohydrates, however, which can make it confusing to figure out how to count them if you are following a diabetes diet. You'll need to take into account the carbohydrate content whichever way you decide to use your beans. Beans count as both carbs and protein. As a diabetic, you'll have to account for both. 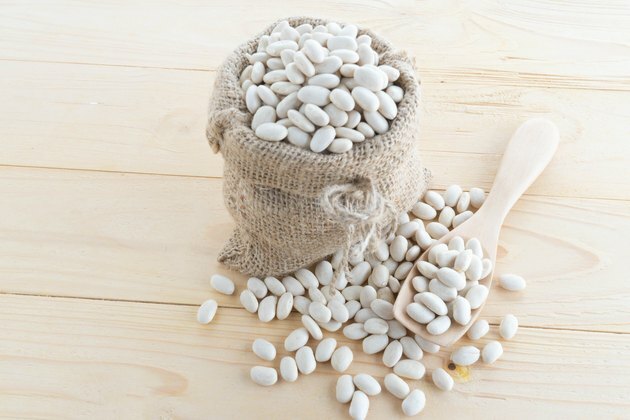 The American Diabetes Association recommends beans as one of the best protein sources since they are low in fat and calories and high in fiber, vitamins and minerals. A 1/2-cup serving of chickpeas provides 7.3 grams of protein, 1/2 cup of kidney beans provides 8.1 grams and the same amount of lentils provides 9 grams. The ADA recommends eating beans as your protein source at least a few meals per week. Beans contain a lot of starch and fiber, so they are often classified as starchy vegetables. For example, 1/2 cup of lentils or kidney beans has about 20 grams of carbohydrates, including approximately 8 grams of fiber, and 1/2 cup of chickpeas has 22.5 grams of carbohydrates, including 6.3 grams of fiber. For a diabetic, this would be about 1 1/2 15-gram carbohydrate servings. The U.S. Department of Agriculture recommends counting beans as a protein if you haven't already met your recommended protein servings with other foods and counting any remaining servings of beans you eat as part of your vegetable servings. If you are diabetic and counting carbohydrates, however, you'll need to count the carbohydrates in the beans and include them in your total carbohydrates for the meal even if you are using beans as your protein source for the meal. When carbohydrate counting, you can subtract the grams of fiber from the total carbohydrates to get net carbohydrates if a serving of the food contains more than 5 grams. This will bring the carbohydrates in many types of beans down to about one 15-gram serving. Although beans provide protein, they shouldn't be your only protein source because they don't contain all of the essential amino acids contained in meat and other animal-based sources of protein. As long as you eat a mix of protein sources — such as rice and beans, beans and dairy or beans and meat — throughout the day, you'll get plenty of the essential amino acids. What Food Group Are Legumes In?